What is Poverty (and consequently Development) really? 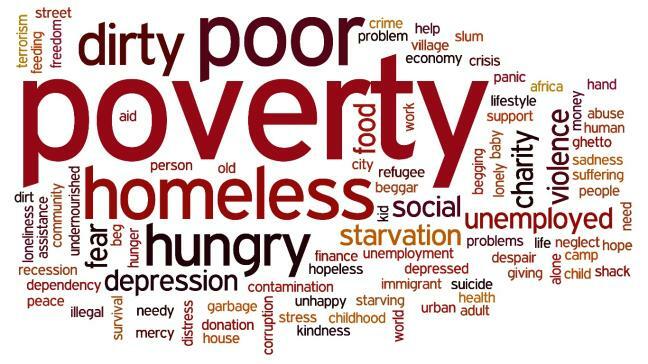 Poverty, poor, impoverished, deprived, deprivation, and everything with ‘a lack of-something’ are words, or concepts that are widely used but nobody can give a clear answer to what it really is. In this article I will try to go deeper into it. It is the first article in the “Poverty Reduction” series I’m about to write. I would like to address the basics in a way every one can understand or relate to. I would like to start with a very positive note. The idea that many of us (still) have, that western Europe, North America, and Australia, New Zealand, Japan and South Korea on the other side of the planet are the developed countries and the former ‘USSR’ and east Europe were the so-called second world and the rest of the countries is the ‘third-word’, does not hold water for many decades by now. Yes, in the past, in the 1950ies – 1960ies, when much of the world still was colonized, when there was apartheid both in the USA, South Africa and Palestine, yes, then there was that big of a difference. So many more people were hungry, didn’t go to school, huge extended families, wars (Cold War, Vietnam, civil wars (Angola), liberation wars (much of Africa), many more people died from malaria and other diseases, and children didn’t go to school at all (if there were schools). Nowadays, just looking at basic statistics from the UN, World Bank and others, the world never has been better off than it is now. People are much richer, there is a huge amount of ‘middle income countries’ (countries that are neither developed as The Netherlands, nor are as poor as Malawi) such as Malaysia, Thailand, Botswana, South Africa, Brazil, and China. In all those countries children do go to school, also the girls. Families are having 1 or 2 children only, just like ‘us’, they have jobs, cars, houses, bank accounts, pay taxes, complain about people throwing fridges from the 10th floor in their apartment. I simply notice a lot of prejudice against people from “poor” countries (“they should stop making babies, they should do this and that”). Yes, that was true before my generation was born but nowadays not anymore. However, despite all the positive global changes, still more than a billion, or the ‘bottom billion’, people are living in poverty, go hungry, and die from preventable measures (such as diseases). It is up to how they are defined on a global and political level and also how a definition can change the amount of poor people. So, the words of the introduction always need to be put in the right context with the right nuance and we need to look who has interest in a low number of poor people and a high number of poor people. Thus, we are not talking about numbers on a spreadsheet. Yes, as I will explain in later posts, income is measured and GDP is compared between countries. Yet, the numbers are not poor, people are poor. People who are struggling every damn day to make ends meet. I don’t mean people in poor countries as there also is poverty in rich countries while that doesn’t have to be and that is entirely a political choice based on the sentiment in a country. Often, being poor also is a feeling, it is subjective, it is each individual’s experience and another cannot judge or justify whether that is true or not. Poverty is Multidimensional. Poverty is not a lack of money, or not having enough to buy what you need. It is also ‘the freedom of choice’, or, the ability to choose what you eat, which school your kids are going to, freedom of expression without being jailed for it, and to have the freedom to choose where you spend your money on and that includes the “oh there’s too much month after my money is spent” idea. Looking at the last statement, I think everyone has said that at least once or know someone who is always short at the end of the month. That person does not have the freedom of choice how to spend money as it is already decided for him/her. But, is that person then automatically living in poverty? Or? It is also multidimensional in the sense of needs, do I have assets to go around? A car, a cow, a stove, electricity? Do I have access to natural resources (for example there are many landless farmers, and herder’s land is taken away for housing development or soybean production), do I have enough social contacts? Who cares for me when I am sick? Can I afford healthcare (both in for example the USA and Zambia). Do I have access to banks, credit(cards), and are loans for investments made available for people like me? What about my ethnicity? Does my ethnicity play a role in finding a job? Or the color of my skin? Or the tribe I belong to? Or the religion I have? Or the age I am having? In other words, am I capable to use my full human potential to live a life in dignity and in freedom? If you can answer this question with “yes”, then consider yourself lucky. You truly are privileged. Poverty on the news is about the billion people I mentioned before, but, that is the worse off billion people. There are so many more people who cannot say yes to the question whether they life using their full human potential. Meaning, at least some of their dimensions are poor and needs ‘development’. In conclusion, it is impossible to pinpoint exactly what poverty is, when someone is poor or not as all depends on definitions. Besides that the world never has been better off, there is a huge ‘bottom’ group of people, ‘the bottom billion’, who have nothing and urgently need help. The people above that group are not suddenly non-poor, or rich even, as everyone knows someone who’s salary is finished well before the month is over and cannot live to their full human potential. Poverty and how to solve it is a big and also a subjective problem. The next post will be about ‘Development’. What is development and what has been done till now? And yes, it is controversial!